A 16th-century polychrome jar that once adorned Chinese imperial palaces fetched HK$213.9 million ($27.4 million) at Christie's auction on Monday night. The spherical porcelain object depicts a playful scene of several animated fishes swimming in a pond, surround by colorful algae. The jar exemplifies the maturity of producing wucai (five enamels) ware during the reign of Ming Dynasty (1368-1644) Emperor Jiajing. It was fired at least three times: first a layer of qinghua cobalt blue patterns, then a coating of glaze and after that, another layer of colors, including yellow, red and green. It sold for HK$44 million at auction in 2000, then a world record for Chinese porcelains. 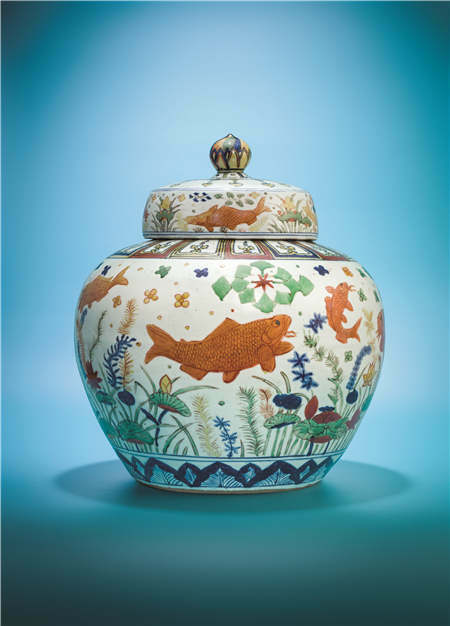 The fish jar was in a private collection of 13 imperial objects from the Ming Dynasty that was put under the hammer at Christie's. A qinghua cobalt blue basin from the early 15th century in the same collection grossed HK$14.5 million.